BIS Oxford Economics has reversed its earlier prediction that Melbourne will suffer a surplus of apartments, saying faster-than-expected population growth now meant the city would be in balance or even face an undersupply. The consultancy, which warned of a 15,000-apartment glut in the Victorian capital two and a half years ago and repeated the warning last year, now says census figures that showed the state had 109,000 more people than previously expected turned the situation around. “If you translate that into households, it’s close to 35,000 extra households in Melbourne,” BIS managing director Robert Mellor told The Australian Financial Review on Wednesday. The findings, part of the consultancy’s revised outlook due to be reported at briefings this week, reflect other census figures showing the proportion of students – a key demographic occupying apartments in the CBD, where Melbourne’s high-rise supply has been concentrated – rose to 27 per cent of demand for inner city apartments in 2016 from 20 per cent five years earlier, Mr Mellor said. Crucially, the revised forecast also adds strength to arguments that the tightening of credit and loss of stamp duty exemptions for local investors, combined with a growing refusal by local banks to lend to overseas buyers, could lead to a shortage of new housing stock in two years’ time, when the current housing construction boom ends. Approvals of new apartments, townhouses and semi-detached dwellings in Victoria – which accounted for 28 per cent of the national total – have fallen on a yearly basis for the past 15 months, official figures for July showed. Many developers still think there is a shortage. South Africa’s Redefine Properties said in July it will develop a 700-bed student accommodation facility on a central Melbourne site it bought this year from the CFMEU to meet an under-supplied market. BIS predicts that apartment commencements in Victoria – where the market is dominated by Melbourne – are in the process of shrinking from a 2015 peak of nearly 19,800 to a trough in 2021 of just over 7200. Victoria was the east-coast capital most likely to suffer an undersupply of apartments, he said. While Sydney and Brisbane would also suffer a decline in new housing starts, Sydney’s reduction would be less severe in relative terms and Brisbane was already in a position of oversupply that would take some years to absorb. 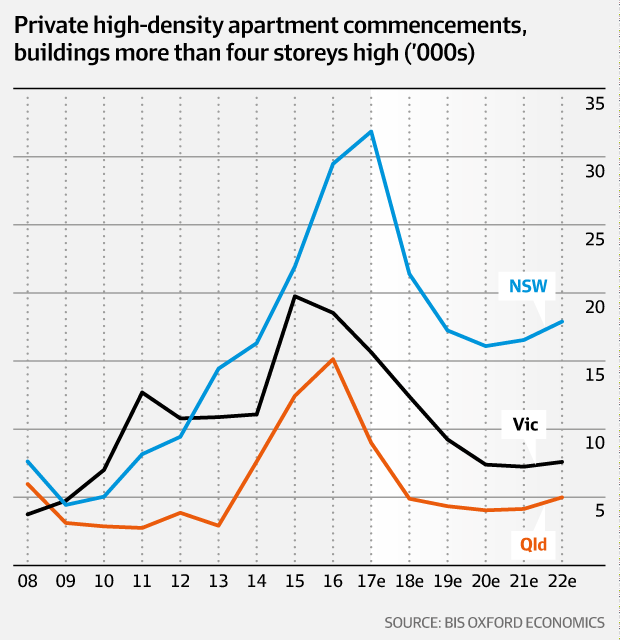 New high-rise housing starts in NSW were likely to near-halve from an estimated 2017 peak of nearly 32,000 to just over 16,000 in 2020. Queensland would see commencements drop by more than two-thirds from more than 15,000 in 2016 to just over 4,000 by 2020, BIS forecasts. The restriction on new supply down the track would push rents higher and would provide more of an incentive for institutional investors to back the fledgling built-to-rent sector, Mr Mellor said.